BiWon is a small slightly chaotic Korean BBQ restaurant in the West Side of Hornsby. BiWon is well liked by Hornsby locals and is frequented by many Koreans who come from all over town to eat its BBQ. Prices are reasonable and portions are large. I like the basic, simple surroundings of the restaurant, the very fresh food and the chaotic atmosphere on a busy Saturday night. As soon as a table is vacated, it is cleared, cleaned and another group sits to eat. Staff are well natured, friendly but always on the go. The place has an energy and pace that is good to enjoy. It is busy, busy, busy. To me, Korean food looks like it has evolved separately from almost all other foods; it has different core ingredients, different flavours and different table etiquette. The Korean food at BiWon is healthy, great to share and fun to eat. The staff are happy to show you what to do and how to go about eating the food. We ordered the Beef BBQ ($79.00) which is plenty of food for three hearty appetites or a family of four. 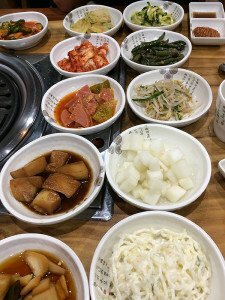 On the menu, there are pictures for everything and our BBQ simply showed a plate of thinly sliced Wagyu beef pieces three ways, but it’s the Banchan or side dishes that turn this meal from a simple BBQ in to a feast! Of course, one of our Banchan was the traditional Korean Kimchi using fermented and spicy cabbage. But we also had a Kimchi of courgettes as well. Very nice. Kimchi is something that accompanies all good BBQ, but we also had potato, radish, seaweed in a light mayonnaise, pickled cucumber and a green salad with a sesame oil dressing amongst a range of eight or nine Banchan. The fun of Korean BBQ is the cooking over a small BBQ built in to the table. You place your meat on to the hot plate and when it is cooked to your liking you peel it off, put it in to a piece of fresh lettuce with a sliver of raw garlic and some sesame paste and down the hatch it goes! Each table has a silver extractor dangling above it, to remove the BBQ smells from the restaurant as they build up. 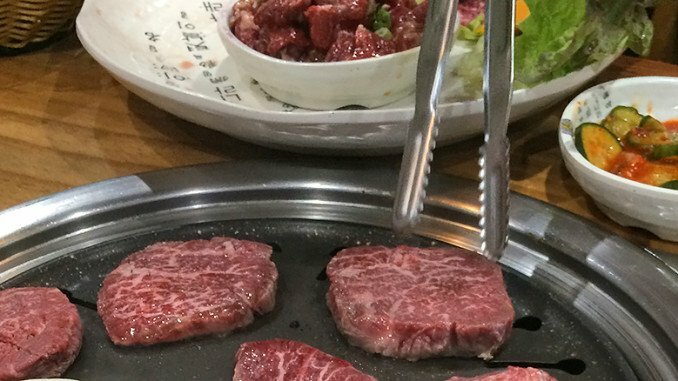 Traditional Korean etiquette meant that in the past little conversation took place during a meal and your BBQ meat and lettuce would be eaten in one mouthful – that makes this a perfect restaurant for teenagers! Korean food used to be full of etiquette that I find far too complex to understand, but these days, at Biwon, it is a fun, exciting way to eat. The menu at Biwon is huge and so we also ventured away from the BBQ and had a spicy fried chicken. Now, this is not health food; deep fried chicken which is lightly battered and slathered in hot chilli sauce! Spicy fried chicken is a great dish to contrast with the tarte and fresh flavours of the BBQ and it is also a perfect dish to take home and eat cold the following day. BiWon is a bit of an institution on the West Side of Hornsby. It can get very busy on a Saturday evening and busy means slightly chaotic too. If you are expecting to walk in to BiWon, be met warmly at the door and have one-to-one attentive service, you are in for a shock. This place is much more in the realms of grab a table, signal frantically to the waiter and tuck-in as soon as the food arrives!